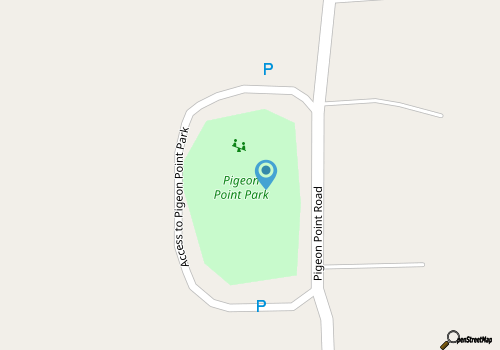 The park is easy to access via Emmons Street and Calhoun Street, which intersect with Pigeon Point Road just a block or so away from the Beaufort River. The main park patrons here are local residents who live, full-time, in the Pigeon Point neighborhood, a small region of smaller homes and mostly one-story early 20th century structures. The neighborhood has gained notoriety over the past few years, and is quickly becoming one of the most desirable places to live in Beaufort north of downtown, thanks in no small part to this well-tended and perfectly picturesque city park. Several small parking areas are located along the paved semi-circular drive that hugs the park's borders, ensuring that all visitors have easy access to the heart of the park itself. 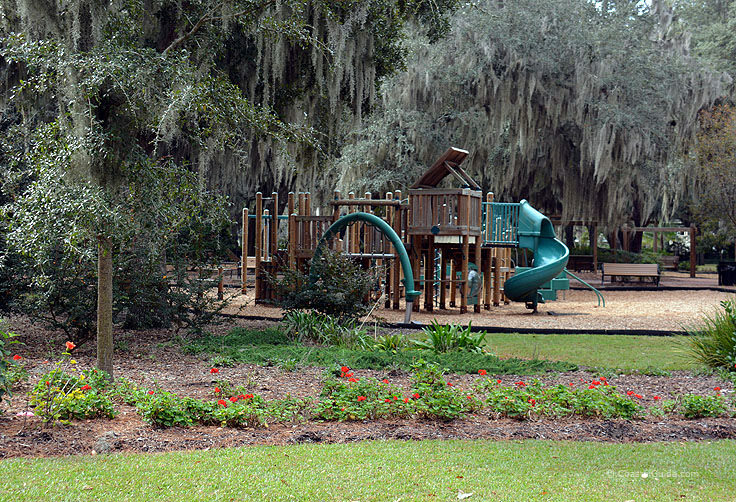 The main center of the park features a wide, spread-out playground, complete with slides, swings, see-saws, small wooden "obstacle courses," and other park standards designed to keep young ones fully entertained. 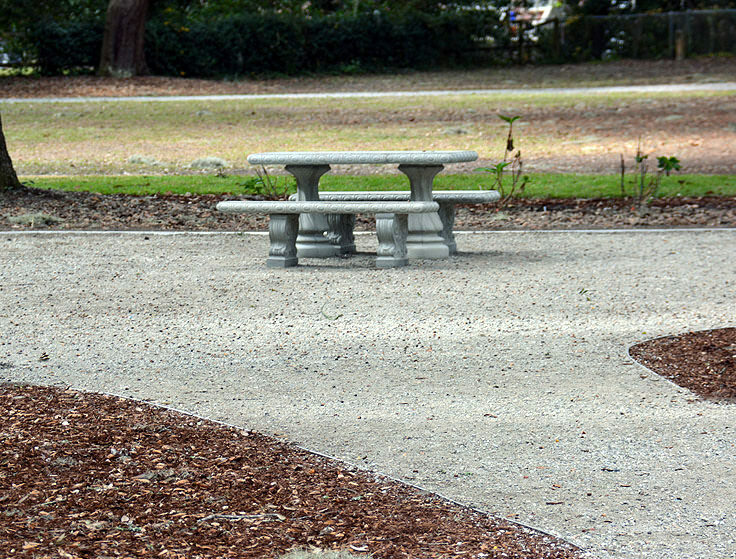 Small pedestrian paths cut through the heart of the park, and adults can keep a close eye on the action while resting comfortably on a series of wood and iron benches that are scattered throughout the site. Picnic tables are also located on-site for easy snacks, and drinking water and trash receptacles are readily available as well. 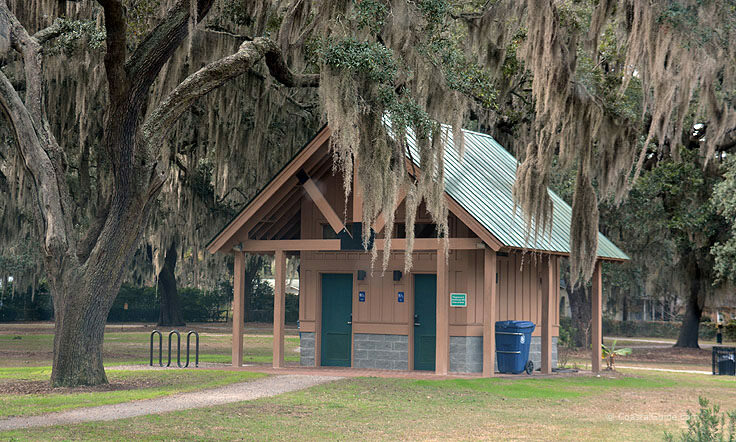 While the park has a seasonally stationed port-a-potty, there are no main restrooms on the premises, so visitors, (especially families with kids), should come prepared. Parking is free and the park is open during daylight hours, although tall street lamps are stationed throughout the park for folks who leave the Pigeon Point Park a little late. 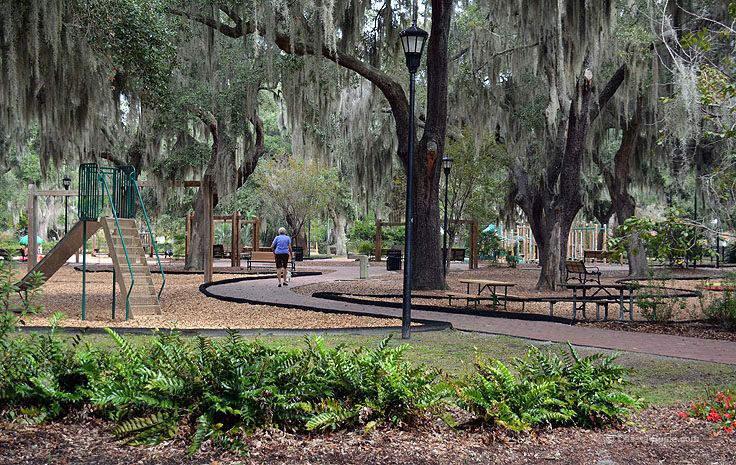 The big attraction at the park, besides the ample playground equipment which will keep young patrons smiling, are the abundant live oak trees, covered in Spanish Moss, which provide a wide canopy of shade in virtually every area of the site. 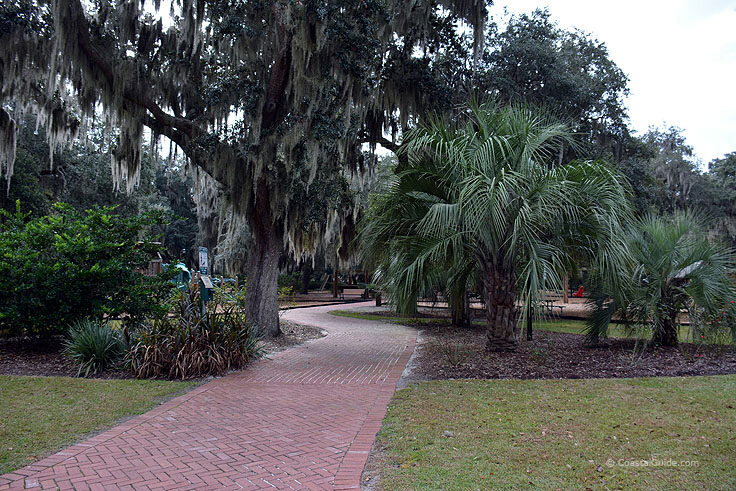 In fact, the low-hanging Spanish moss appears to drape over the entire scene, making the park gorgeously attractive and almost mythical-looking during every season. In the spring and summer, the park is also lined with long rows of seasonally colorful blooms, including azaleas, violas, and assorted perennials and annuals, which makes the Pigeon Point Park a perfectly beautiful spot to sit, relax and enjoy the scene. Whether a visitor is a newcomer to the Pigeon Point region hoping to meet and mingle with friendly neighbors, or a Beaufort visitor who wants an easy and pretty local spot to enjoy a breather and a little fun for the kids, Pigeon Point Park is a surprisingly lovely and often-overlooked local site that can make anyone a fan of the coastal South Carolina scene. 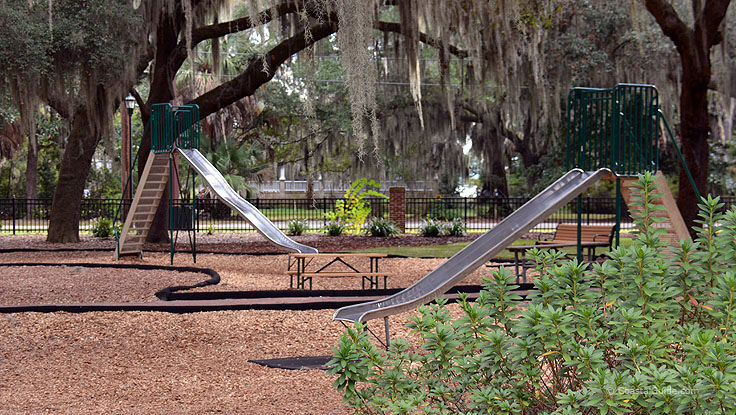 With ancient live oaks, miles of Spanish moss, and plenty of playground equipment to keep little guests busy, a quick trip to Pigeon Point Park will add a touch of beauty and great outdoor entertainment to any Beaufort vacation agenda.